Father's Day is tomorrow! Do you have your gift yet? If you do thats great but do you have box for your gift? If the answer is no, then you will love today's diy. 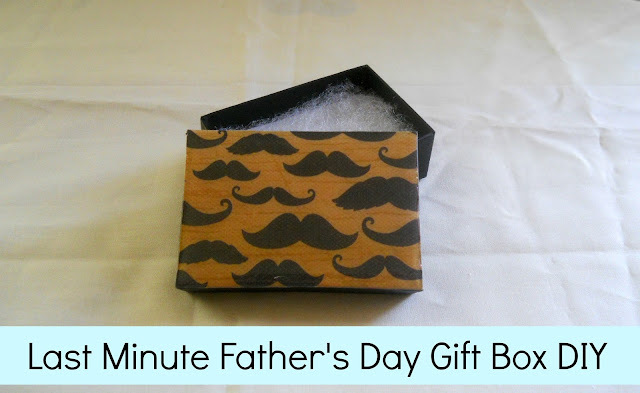 Today we will be making over a small gift box. You can get all the supplies at your local craft store and when your done the box itself looks pretty fancy. Step 1: With your pencil trace around your box lid and cut out your piece of paper. Step 2: Glue your scrapbooking paper to your box lid, using some Mod Podge. Step 3: Take your dimensional magic and apply a thin coat to the top of your box lid. Then let it dry. Love the mustaches!! I also love the look the dimensional magic gives it.